Synopsis: Resident Olivia Griffiths, working with the Tahoe/Colonial Collaborative in south Sacramento, started an organic gardening program with children participating in the START (Students Today Achieving Results for Tomorrow) after school program. 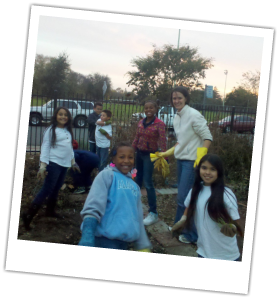 Olivia collaborated with the after school program and gathered the kids together to work in the neighborhood garden located behind Tahoe Elementary School. Through this program the kids are being introduced to healthy eating and learning where healthy foods come from. They are able to plant their own seeds and see that food comes from plants and not just from a package at the store. The goal of this project is to encourage kids to eat healthy organic foods and be active participants in their neighborhood garden!